Ever since he was a little boy he had a restless character. Not only he was interested in music but in sports as well. Despite the fact he was a fanatic supporter of Olympiakos F.C., he found himself playing soccer at Panathinaikos F.C. junior team, but still wearing a red shirt underneath. Under the coaching of Mimis Domazos, he played for a year and then turned on at karate and basketball. His primary contact with music and theater came at the 'Happy Village', a summer camp in Varimpompi (area near Athens), were he participated for 4 years at all music and theater activities both as a camper and leader of the campers. That place learned him the meaning of team spirit, organising and working. He gave up on school at the age of 16 to study electronics in a private school, from where he graduated and got a degree. His first appearance on a TV show was back at 1989, when he was presented at the TV show called 'Come To The Light', aired at the 2nd national TV network. This show was practicly the first greek reality show, as out of 1.500 young actors, singers and dancers and after convincing a proffesional comitee, only 20 made to the finals. George -Vasiliou(then)- was one of them. He earned and won the opportunity to study, dance with Daniel Lomel, acting with Niki Triantafilidou, music with George Hatzinasios while other great artists from his field of interests (such as Minoas Volonakis and Lakis Lazopoulos) taught him out of their own experiences. During summer of the same year, he succesfully enters the Minoas Volonakis audition for the classic greek drama of Sofoklis, 'Antigone', starring Aliki Vougiouklaki (the ever unforgetable greek actor). Composer was another greek giant, Mikis Theodorakis. Rehearsals lasted over 2 months and the opening took place at the ancient theatre of Epidavros. This ancient drama participation, at the age of 17, was and still is one of the greatest experiences of his life. He was the youngest participation for the time, not only in a historic play but in a historic place as well. During the same summer he decides to change his course from theater to music. Not hesitating to enter another audition that held in a night stage named 'TUNNEL', he got the job again, as a singer this time. In summer of 1991 he participates in concerts all over Greece along with, the upcoming star at the time, Christos Dantis. Right after summer, on September, George and the composer Avet Kizirian enter contest at Thessaloniki's Music Festival with the song 'You Don't Want Me Dare'. This year 2 young music stars begin to shine... George Alkaios and Sakis Rouvas. That is the time when George Vasiliou becomes... George Alkaios. George wins the first singing prize and starts his carrier... on his return in Athens he signs with B.M.G. records. George will not rest in his singing success, so he took live action in both music and lyrics composition. Before the release of his first personal music album George writes songs for other artists. Songs for commercials, even for a world wide refreshment. But above all, songs that lasted in time and continue their succes till now. Miltos Karatzas, the director of B.M.G. records, releases the first personal album of George Alkaios titled '?e ???? t?a?'. The lyrics were assigned to Evi Droutsa. 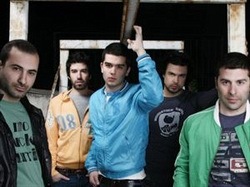 The song 'Ti- Ti' makes a difference in greek music since it was the first time that eastern sounds combined with western pop, a fact that altered the music standrds for the time. This was only the begining. 6 personal records were to come, all with huge success. 5 golden and 3 platinum records. A black scarf on his right hand becomes his trade mark for the next 5 years. He is the only greek artist that entered a personal fetish to the fashion world. 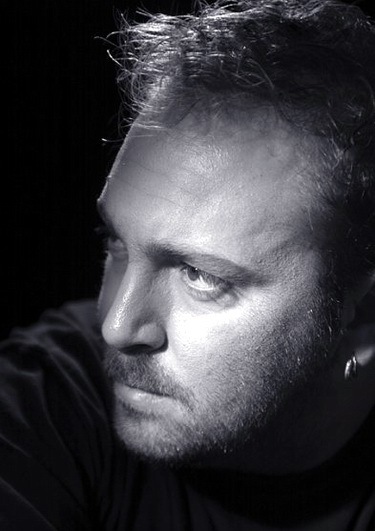 His songs have a special and unique sound as a result of his active participation even in producing with the valuable advice and experience of the producer Gavrilis Panztis. Their 9 year collaboration often became golden and platinum. His outstanding success in combination with his low profile character, were the reasons he had so many proposals from record companies after his contract with B.M.G. expired. After 3 months of negotiating and talking, Dimitris Giermenitis and George Polichroniou directors of Sony Music, signed George Alkaios with their company. The first record with the new company, titled 'silent sounds', shoked the whole coyntry. His extreme photos along with his new look made the record gold in less than 24 hours. 4 new records were to come. All of them golden and 2 platinum. In year 2003 after the expiration of his latest contract with Sony Music, which was right after his contract with B.M.G., George decided to sign with a greek music company rather than an international one. Alpha Records offered him the opportunity of music creation which made him to accept the collaboration. Not only his new contract but his new album as well, persisting of 12 new songs in a DVD package, made some real noise. The same record company, a year after, released a special edition of this album with a 2 hour DVD dedicated to his artistic presence(songs, video clips and amateur videos of his concerts). Famous personalities from all fields (singers, actors, models, presenters, journalists) talk about him. 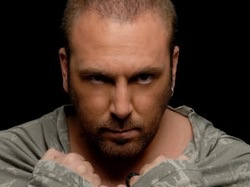 George Alkaios after 15 years in the music world decides to change chapter in his music creation. He created a new music profile, carrying and transfering a different emotion through every new song. some thing he had always done despite of the music style. George's reputation has spread out of Greece; he is very popular in Greek communities all over the world. He is one of the few Greek artists who hold the record: for the last ten years he is performing without interruption in Cyprus, Germany, Great Britain, Canada, Australia and the U.S.A.
George Alkaios is famous abroad as an ethnic singer, and so he has performed in great theatres and concert halls. House of Blues, Manhattan Center, Metro, Taj Mahal, Crown, Fox Studios, Vic Theater are some of the places in which he appeared. Recently he performed twice in Tirana's Concert Hall in Albania; he was also invited for concerts in Bulgaria and Romania. More then 300000 people have watched George perform live all these years. George Alkaios is not only popular to the Greeks of diaspora, but he has also entered in the international charts. In year 2000 his song 'Simadi' was accepted in the music collection of France's Buddha Bar. He is the first Greek artist to be accepted in this album. A year after that, 'Sirmatoplegma' becomes an anthem for the Turkish team Galata Sarai, when it won the European Super Cup and the UEFA Cup. His first platin LP abroad came from Sweden, when Antique performed his song 'Opa-opa'; and became famous all over Europe. One of the most important Greek singers, Despina Vandi, is performing the same song in Greece and abroad. His song 'S' agapao' has already been translated into English and is expected that it will be performed by a foreign artist. The same song is a hit in Eastern Europe by a famous Romanian artist although George has never given his permission for this production. His song 'Ki olo mou leipeis' will be used as musical trailer by the greatest broadcasting company of Bulgaria. OPA performance can be seen here. 26/02 After series of scandals connected with leakage of participating songs to the internet, disqualifications of Katerine Avgoustakis and Elefteria Eleftheriou entries, today Greek broadcaster ERT was forced to publish all participating entries in Greek preselection on it's official site. После серии скандалов, связанных с публикацией участвующих песен в интернете, дисквалификаций заявок Катерины Августакис и Элефтерии Элефтериу, сегодня греческий телеканал ERT был вынужден опубликовать все участвующие в греческом отборе композиции на своем сайте. 09/02 Greek broadcaster ERT has announced disqualification of one of participants of the national preselection. Remix for Katerina Avgoustakis entry has been available in the internet since last November, and, as national preselection rules prohibit any public publication of the preselection entries prior to the first presentation show on March 5, the broadcaster has taken the decision to disqualify the entry. Греческая телекомпания ERT приняла решение о дисквалификации одной из участниц национального отбора. Ремикс на песню Катерины Августакис был доступен в интернете с ноября прошлого года, а поскольку правила национального отбора запрещают какую либо публикацию песен до их официальной презентации 5го марта, телекомпания была вынуждена снять композицию с отбора. 08/02 Titles of songs and running order of performances in Greek final to be held at 22:00, on Friday, March, 12 were released. It will be broadcast live by state television channel NET. The Greek candidates will perform their songs before Greek audience in a special program on Friday, March, 5. Объявлены названия песен и порядок выступлений в национальном финале греческого отбора, который состоится в 22.00 местного времени в пятницу, 12го марта и будет транслироваться государственным телеканалом NET. Презентация песен греческих кандидатов пройдет в специальной программе в пятницу, 5го марта. 21/01 Greek national final has finally got it's date, it has been set for Friday, March 12 and will take place in ERT Studios. As earlier reported, after one withdrawal it will feature 9 acts. Final can be attended with special invitations, which among others are available for OGAE members from any country. As ESCKaz has informed, the songs taking part will be previewed by ERT in a special show on 5th of March. Греческий национальный финал получил, наконец, свою дату, он назначен на 12е марта и пройдет в студии ERT. Как ранее сообщалось, после снятия одной заявки, в нем осталось 9 песен. Посетить шоу можно по специальным приглашениям, которые помимо прочего доступны всем членам клубов ОГАЕ любой страны. Как писал ESCKaz, песни, принимающие участие в отборе будут презентованы ERT в специальном шоу, которое будет показано 5го марта. 15/01 On Saturday 27th of February, during a special TV program Greek broadcaster ERT will present the 9 songs that will compete in the national final, which is scheduled for mid-March. The show will be prerecorded and the shooting will take place in the coming days in the studios of ERT. After the first presentation, the songs will be rotated on radio and TV stations in the country for the public to get familiar with them prior to the NF. Show hosts of the evening will be Despina Fagkra and Demetra Agkriotou, journalists of ERT. The names of presenters of the national final are yet to be determined. В субботу, 27го февраля, во время специального телешоу греческая телекомпания ERT презентует 9 песен, которые примут участие в финале национального отбора, намеченном на середину марта. Шоу будет показано в записи, его съемки пройдут в ближайшие дни в студии ERT. После первой презентации, участвующие песни будут ротироваться на радио и телеканалах страны для того, чтобы публика могла с ними познакомиться до отбора. Ведущими презентации будут Деспина Фагкра и Деметра Агкриоту, журналисты ERT. Имена ведущих национального финала пока не определены. 13/01 The candidates to compete at the Greek final for the selection of the singer to represent Greece at the Oslo Eurovision Song Contest were reduced by one. Despina Ritsi announced her decision to walk out of the Greek national final, because she does not have enough time to prepare her candidacy. She said that her obligations in France as well as her difficulty to choose an appropriate song within the deadline given forced her to withdraw her candidacy. Число кандидатов на участие в греческом национальном отборе уменьшилось на одного человека. Деспина Рицци объявила о снятии своей заявки с отбора, поскольку у нее не было достаточно времени подготовить свою конкурсную песню. Она заявила о том, что ее обязательства во Франции и сложность с подбором подходящей песни в установленные сроки не позволяют ей принять участие в национальном финале и она вынуждена отозвать свою кандидатуру. 18/12 Greek broadcaster ERT has published official list of participants of national preselection for Eurovision Song Contest 2010, proposed by local record labels. Katerine Avgoustakis took part in Belgian preselections 2002 and 2006, Eleftheria Eleftheriou tried in 2006 for Cyprus. You can find more about the entrants watching their recent videos here. 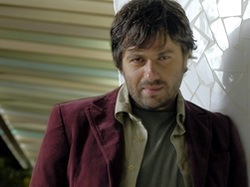 The Greek final will take place in late February and it's art-director will be Fokas Evangelinos. Winner will be chosen by 50-50 jury and televoting. The songs will be presented in February through special broadcast on ERT. Греческая телекомпания ERT опубликовала официальный список участников национального отбора на Евровидение 2010, предложенных местными рекорд-лейблами. Katerine Avgoustakis принимала участие в бельгийских отборах 2002 и 2006, Eleftheria Eleftheriou пробовалась в 2006 в отборе Кипра. Вы можете получить дополнительную информацию об участниках, просмотрев их недавние клипы здесь и на русском здесь. Финал греческого отбора пройдет в конце февраля и его арт-директором станет Фокас Евангелинос. Победитель будет выбран смесью жюри и телезрителей. Песни будут представлены в феврале в специальной программе ERT.